Provides 0°-30° of horizontal splay and 0°-30° of vertical tenting to help align and straighten your wrists, arms and shoulders. Equipped with a fully integrated SCM STC II Smart Card Chip, fully compliant with security regulations. Operates in both synchronous and asynchronous mode. 3V and 5V selectable and provides a totally adjustable transaction speed. Features full-size tactile feedback keys to further increase comfort. 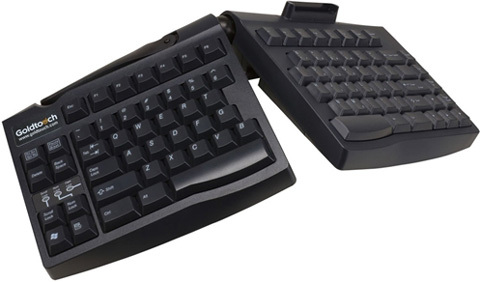 Adjustability and comfort - Like all Goldtouch keyboards, the ErgoSecure provides 0°-30° of vertical tenting and 0°-30° of horizontal splay to help align and straighten your wrists, arms and shoulders. Full-size tactile feedback keys further increase comfort. Smart card security - This keyboard is equipped with a fully integrated SCM STC II Smart Card Chip, which is fully compliant with security regulations, operates in both asynchronous and synchronous mode, is 3V and 5V selectable and provides a totally adjustable transaction speed.